The Ashmolean Collections Online is an ambitious project to digitise the extensive and varied collection, Keepthinking developed a website displays the work to its full potential; and embarked with the Ashmolean upon an extension of the Eastern Art Online platform, including incorporating highly developed search to make the large, and continuously expanding (new digital material is added every month), collection easily accessible. The Ashmolean is the University of Oxford’s museum of art and archaeology, founding in 1683. 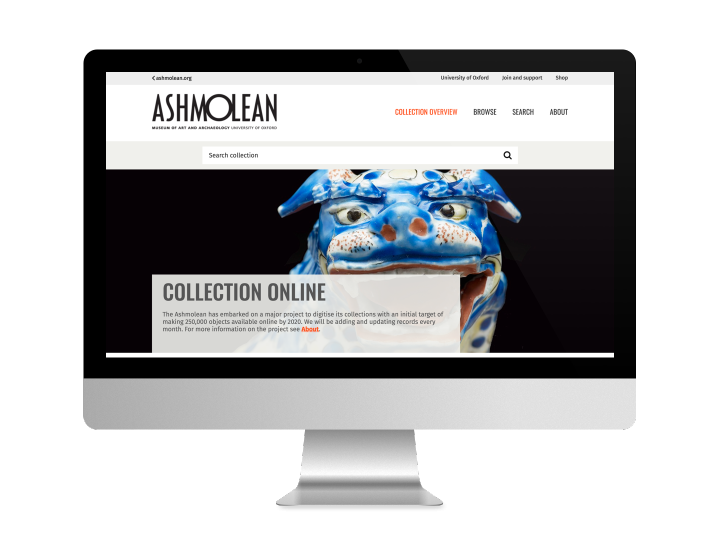 The updated website showcases the extensive collections of the museum, bringing together (for the very first time) material from across the museums’ curatorial departments. The collection spans more than five thousand years, and contains over a million objects. 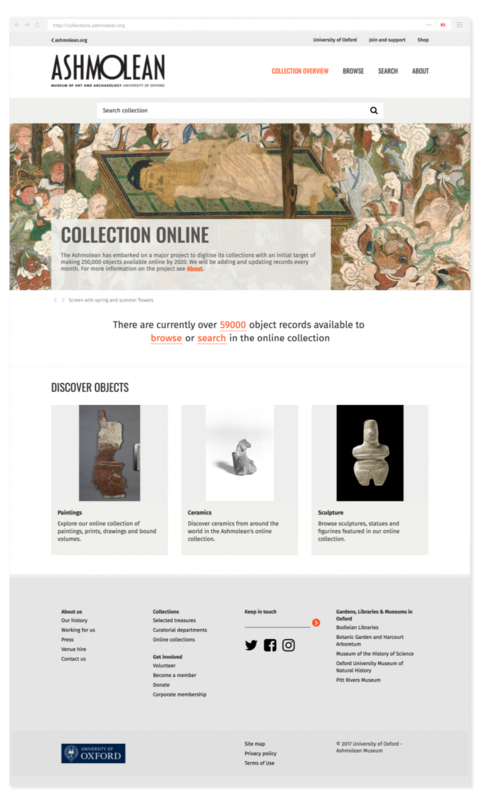 The homepage showcases the project’s goal, its progress, the enhanced search, the browse, as well as providing three immediate entry points to the main areas of the collection; painting, ceramics and sculpture. The browse page contains an interactive timeline with object types, as well as the listing of the collections’ objects in a random order. Users are able to browse the timeline by object type, or by sliding the bar to focus on any time period between the wide range of -3000 BC to 2000 AD. They can also choose to start with the individual objects displayed beneath themselves. The advanced search provides the website visitor with an in-depth and intuitive search; enabling them to search for and easily locate specific items within the vast catalogue. Among the long list of additional search options are: period, material, technique, weight and depth. The results page allows a user to easily refine their search further by using the timeline. 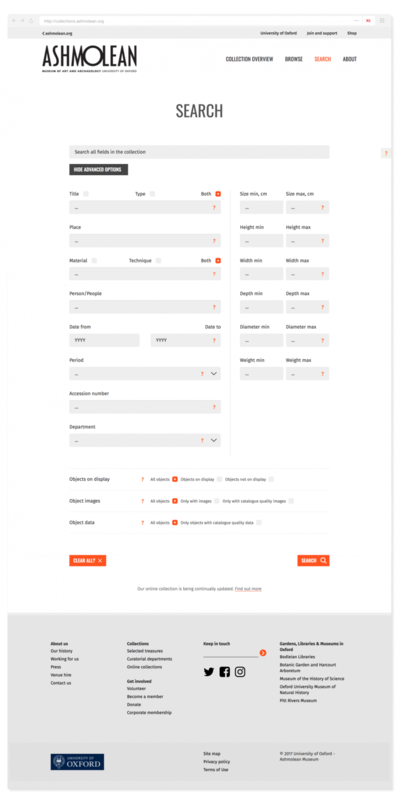 Users can reorder the results they see, and they can also choose to change from the grid-view which prioritises the information, and the list-view which prioritises the data. The individual object page presents the visitor with a high resolution image of the object which they can open in a lightbox and zoom in to see minute details. The amount of information about each object is varied - with some having inventory level information only, whereas others have very detailed cataloguing. The design is very adaptive to this. The catalogue information about each object also contains hyperlinks, and these keywords and names allow users to continue exploring and browsing the collection. The object trails serve as a grouping under which a curated selection of objects are displayed, providing the visitor with interesting contextual information about the objects connected to the trail. These trails are organised by theme (such as Religion and Belief, or Creativity and Craftsmanship). Each trail gives the visitor another way to interact with and explore the collection.